Get ready for an adventure of mammoth proportions – Ice Age: Dawn of the Dinosaurs™ – The 4-D Experience! 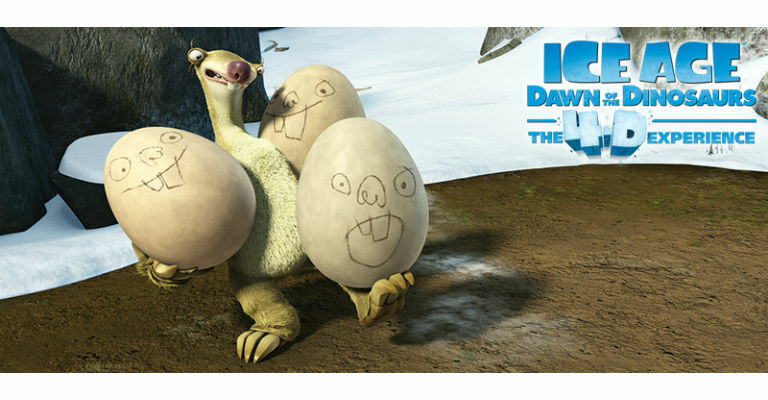 Our favorite sub-zero heroes, Manny, Ellie and Diego venture into a mysterious underground world after Sid the Sloth stumbles across three abandoned eggs and decides to raise the baby dinosaurs as his own. Once the eggs hatch, the adventure begins in the lost world of the dinosaurs! Featured in eye-popping 3-D with an all-star voice cast, including Ray Romano, John Leguizamo, Denis Leary and Queen Latifah, Ice Age: Dawn of the Dinosaurs™ delivers more thrills, more chills, and more mammoth-sized laughs for everyone! Experience every twist, turn, high and low as your seat moves in time to the 3D action on screen in our 4D Motion Ride. You can expect to be blasted with wind, smoke and water, and you’ll even be able to smell the action! The ride is also unsuitable if you are pregnant, suffer back or neck problems, have heart problems, have a pace maker or if you suffer from motion sickness. All visitors must be able to sit upright and step up into the seat (with or without assistance from a carer). Due to the special effects used on the Motion Ride, you and your belongings will get wet. Visitors are responsible for the safe keeping of their own belongings.